The Broadway Cares Classic Collection includes timeless gift ideas which honor the classic musicals of Broadway. This set of four cool silver placemats and napkins is adorned with classic Broadway musical logos that will light up your table. Other exciting items in the Classic Collection include a retro-style cookie jar, a fabric storage box to hold your Playbill collection, Broadway-themed paper cups and paper napkins, a sturdy umbrella, a fun shower curtain, and festive gift wrap to wrap them all up. These beautiful crystals will add luster to your desk. 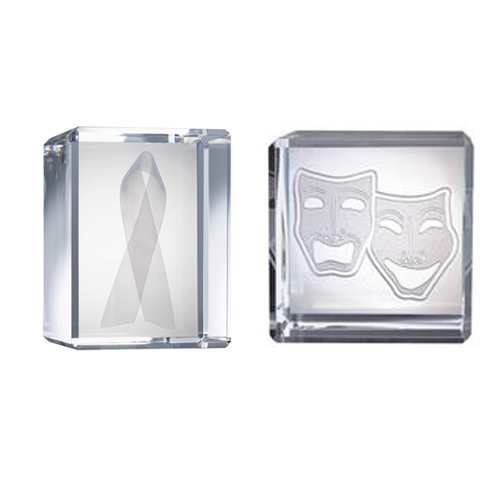 An ethereal red ribbon is etched into one crystal, while the comedy and tragedy masques appear to be floating in their own crystal. Both have beveled edges and are handsomely packaged in their own blue gift box. These attractive new comedy and tragedy masque brooches can be worn to the theatre, or just when you’re feeling theatrical. They are available in silver or gold and come in their own gift box. The theatre masques are also debossed on a set of six black leather coasters which come in a decorative leather display box.